The final episode of Star Trek spin-off TV series Enterprise was screened in the US on Friday. It leaves fans with no new Star Trek shows on air for the first time in 18 years. Presented as a prequel to the original Star Trek television series, Enterprise has run for four series - but was axed after struggling in the ratings. Producers have refused to extend it despite a campaign by fans who have tried to raise funds to keep it alive. Should Enterprise have been cancelled? The 98th and final Enterprise show - entitled These Are the Voyages - will be broadcast on US channel UPN as part of a two-hour double-episode finale on Friday. Starring Quantum Leap's Scott Bakula as Captain Jonathan Archer, it was the first Star Trek spin-off to last fewer than seven seasons. Enterprise followed earlier Star Trek spin-offs The Next Generation, Deep Space Nine and Voyager. The franchise also spawned 10 movie spin-offs, the most recent being Nemesis in 2002. "I do believe there was some degree of fatigue with the franchise," Enterprise producer Rick Berman said at a US news conference last month. "After 18 years and 624 hours of Star Trek, the audience began to have a little bit of overkill." Following the success of rival sci-fi series Babylon 5, hit shows Battlestar Galactica and Gene Roddenberry's Andromeda are currently attracting sci-fi viewers in the US. Nevertheless Star Trek group TrekUnited collected $144,000 (£77,000) from fans in a bid to save Enterprise, and said it received a further $3m (£1,610,000) donation from anonymous figures in the space flight industry. The original Star Trek series had been extended for a third year in 1969 after a similar fan campaign. 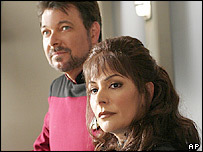 However, US network Paramount refused to renew Enterprise despite fan support. TrekUnited had estimated it would have cost $30m (£16m) to have paid for a fifth series, and returned the campaign money to donors. Do you think Star Trek: Enterprise should have been cancelled? Has the Star Trek franchise had its day or does it deserve to be revamped and returned to TV? Share your views below. The original Star Trek was an incredible step forward in science fiction, the Next Generation and following franchisees built up the mystery, gadgets and civilisations through out the universe but the new Star Trek just brought it all down to earth with a very large bang. The theme tune was a dreadful choice and put me off straight away when I watched the in the first programme and the story line had lost the edge because of the lack of technology that they had to play with. All in all I don't believe the franchise has lost the pull but a new series needs to be written following on from Voyager and taking us yet again beyond the final frontier. No!!!! It was a good Idea.It just needs better writers. It should be allow to go seven years like Voyager. When Enterprise first came about I was very unsure about it. However in the past few months I have really got into it. In fact I'd go as far to say that it outstrips Voyager any day! If there is still money to be made, which there clearly is, then Star Trek will travel onwards! While Enterprise has had some good episodes, and while First Contact is one of my favourite films, Berman and Braga have just destroyed Star Trek with this series and in turn angered a lot of fans. Paramount should never had given them reign on the Star Trek name, especially to someone who admitted that he has never watched the Original Series. They should've heeded Majel Rodenberry's advice when she said Star Trek should be left to rest for several years after DS9 or Voyager were finished. I do not think that Star Trek should have been cancelled. I think that the story lines have been consistently good and well thought out, and that there is still "life" in the Star Trek world. The Next Generation series came out many years after the original. Then we had DS9 and Voyager and Enterprise in close succession. Perhaps a longer gap would allow the viewing public to miss ST's presence on the TV and allow the development of better stories. Enterprise is just "ok." The stories are not bad but they missed a vital part - the technology itself would have been an enemy as it was so new and untested, yet fewer people have "transporter accidents" in Enterprise than in any other series. Enterprise surely should not have been cancelled! The series is a high point in the whole franchise, actors, characters, storylines, production ... all are amongst the best on TV for years. It is a crying shame that Paramount does not see the value of this series, and they will regret it. But there have always been right out stupid decisions by managers lacking the talent to think further than the 2-weeks-report for their shareholders. And this dumbness is no exception. It's time to give it a rest. Didn't do Doctor Who any harm did it? Not as if it will disappear anyway - enough of a back catalogue to last a lifetime! Yes!! The Next Generation was a great program; the other series were tired old rehashes of worn out ideas. No more Trek!! $3million dollars...? Save the whales...? Save the hungry in Africa...? No, save Star Trek of course...! If the world were so generous with such serious issues, as opposed to trivialities like Star Trek, we'd all be a lot happier. Part of the problem with Star Trek is the cross-pollination of older plotlines and characters throughout the series. Enterprise suffered the most from this with visits from the Ferengi (who were previously unknown in Star Trek Next Generation), The Borg (why they had to retread the plotline from First Contact is beyond me), and holodecks. The show started to take a sort of variety show flavr, where the allure wasn't the story, but who would be on next week. I feel bad for the actors, who really pulled out all they could out of this series, but the problems lie not with them, but with the stories and situations coming from the producers and writers. They need some time to rethink the franchise, and I'm more than ready to let them have a break from the show. Absolutely it had nothing that a successful series needed. The cast lacked charisma, the characters were two dimensional, the stories were lacklustre But worst of all for someone who can still remember watching the first episode in the 60s it was full of errors and conflicts with the other Star Trek series. It's best to forget this travesty and just remember that that Star Trek was sent in the 23rd Century and beyond. It is a disheartening thing to happen. I have been a huge Star Trek fan since I can remember disapearing into the wonders of the Star Trek universe. It is a shame to see the doors close on Enterprise which will also close the door on the life line of the Star Trek universe which has thrilled me for many years. I can only hope for a new series sooner rather than later. Enterprise should not have been cancelled, someone other than Rick Berman should have been put in charge. The franchise is not tired, he and his co-writer is. What was needed for this series was new blood. In the last season they finally tried this but by that time the network had already changed the schedule of the show, putting it in a date/time slot which would kill it off. A classic strategy. Despite this, the show has (overall) been quite good. it could have been so much better though. It proved to be a mistake when they cancelled the original series of Star Trek, and it is a mistake to cancel Enterprise. The current series has been very strong in terms of writing and dramatic situtions. If fans feel strongly enough to raise money for a new series, they surely feel strongly enough to watch it. I would suggest that the ratings figures are flat out wrong. I have been a diehard fan of Star Trek for as long as I can remember, and yet, the new series failed to capture the excitement that previous series had. Archer lacked the brashness of Kirk, the authority of Picard, and the gentleness of Janeway. Tucker and Phlox were perhaps the only two members of the cast that brought any charm to the screen. I am sad it can't continue, but perhaps laying this series to rest is for the best. No originality. Constant rehashing of plots from other Star Trek series. Characters I never cared about. Not as entertaining as the original series. No attempt to tell more mature stories (DS9 tried, with some success). R.I.P. Enterprise. I won't miss you. Enterprise failed because it wasn't very good. It trod roughshod over all the existing Star Trek continuity, changing core elements of the rich Star Trek "universe" that had been developed over a huge number of years and series and that the fans, such as myself, hold very dear. Essentially, it wasn't really Star Trek. The final two seasons of Enterprise were a vast improvement, thanks to producer Manny Coto, but the critics still continued to criticise the show. The franchise needs a few years' rest before it comes back with a new concept, new writers and new producers. I for one will miss the show very much and applaud the actors for doing a wonderful job. I don't think making the technology in the show look more advanced than that in the original series helped very much - it was supposed to be set before Kirk's era after all. I know that Trek shows in general take liberties with the timeline, but Enterprise took the biscuit. Each spin-off of Star Trek requires at least a couple of seasons in order to establish characters and scenarios in relation to the rest of the Star Trek universe. The problem is that we have been inundated past saturation point with constant reruns on terrestrial and cable/satellite. It's time to let the show rest for a while. After a few years, it may be possible to air a new show to wider acclaim. The start of Enterprise wasn't that good, the past season it got better. I think they need a roll-off from the Next Generation with Riker on his own ship, as the movie Nemesis talked about. They should have Data's brother in it becoming Data with all his memories since thats how it ended. It's a shame really, the plot was just starting to pick up. They allowed that train wreck of a series Voyager to run for seven years! At least Enterprise is watchable. I never had much time for the programme when it was being shown on TV. Most of the time I didn't even know it was on, never mind on its fourth series. But since I heard it was being cancelled I decided to download a series to have a good look. I have to say, I actually love it. I've become really addicted to the shows, far better than Deep Space 9. I just wish they would have extended it longer or put it on the Sci-Fi Channel. It's a lot better than most of the shows being shown. Yes I think Enterprise deserves to be cancelled. There are far better shows out there that were axed before their time - Farscape springs to mind. Enterprise lacked a key element - possibly the technology or possibly a cast that had on-screen chemistry. But overall the storylines were just tired and lame. The worst part of Enterprise was the introductory music. When I first heard it I cringed. Why did they have to ruin a good thing? It just needed better writers. The stories were weak. No!!! We want more Captain Archer! Yes! Awful storylines, especially the whole of season three, some absolutely abysmal casting of some of the crew members and just a general tainted feel to the whole show. It would have taken a major overhaul to fix it, so best to just give up on a bad idea. Well, have to say they went out on a high. The Vulcan chick was a babe. I would hate to be accused of Schadenfreude but, as a long-standing Doctor Who fan, to be able to watch new Doctor Who whilst the Star Trek fans can't see any new Star Trek is a guilty delight! Now let's have something different. Maybe we can convince the networks to give Joss Whedon's Firefly a decent try instead of bungling its original launch. Enterprise didn't fail. It is one of UPN's highest rated programs. It has a guaranteed viewing audience within the millions every week. It's revenues, while not out the roof, or still reliable and appealing to advertisers, and it is an award-winning show. Star Trek: Enterprise is a resounding success story. Paramount is a failure and totally responsible for its demise. As a lifelong Star Trek fan I tried very hard to like Enterprise but after the first season I could no longer watch it. I couldn't even remember most of the main characters' names, they had made so little an impression on me. It isn't very good, it should be cancelled and I hope Paramount shows better sense in future spin-offs in both the setting, the casting and the storylines. Thank goodness it's gone. Scott (Mr No Charisma) Bakula and all the other B-listers in the cast should be glad it lasted as long as it did. Rest in Peace. Re-show Star Trek: Next Generation with Jean-Luc, there's CHARISMA.